There are many types of oak tree thriving throughout the world but white oak bark may not be the most famous of them. I would guess that the majority of people are familiar with the tree but that far fewer are aware of its illustrious history as a medicine. The bark of the white oak or Quercus alba has been put to great use as an herbal medicine for many centuries and as is the case with many herbal remedies, there is growing scientific interest in the abilities of white oak bark to treat a variety of illnesses. The white oak tree is a familiar sight to people in the eastern parts of North America. It is an extremely impressive tree both in terms of its imposing appearance and its longevity. It grows tall and can spread very wide when given the space to do so. They can live for a very long time with some specimens being over 450 years of age. While the tree itself is very impressive, it is the bark which contains many of the medicinal benefits that we may find of great use. White oak bark contains numerous nutrients including vitamin B12, iron, and potassium. It also has a tannin content somewhere between 15 to 20%. These tannins and the nutrients are believed to be responsible for the bark’s health benefits. It is used to treat a range of sicknesses including diarrhea relief, varicose veins, and the cold or flu. This impressive tree certainly deserves its scientific Latin name of Quercus alba which means ‘fine tree’. White oak bark is on the GRAS list which means that it is generally recognized to be safe and is available in several different forms. The German Commission E has approved it for use as a treatment for diarrhea and it was listed in the US Pharmacopoeia as long ago as 1916 because of its antiseptic and astringent qualities. The Native Americans were long aware of the beneficial properties of the bark. They used it for antiseptic, astringent and anti-inflammatory purposes before settlers to North America picked up the mantle and learned how to use it. Early settlers used the bark to treat numerous illnesses and to help heal wounds and skin problems. While the bark is considered to be the most beneficial part of the tree, the acorns have also been used to make a hot drink that could help control bowel conditions. White oak bark has astringent properties because of the high level of tannins present in its bark. Astringents work by constricting or shrinking the body’s tissues on the inside and the outside. Natural astringents like white oak bark have a variety of therapeutic benefits. Internally, they can help treat bleeding, varicose veins and reduce diarrhea. They also perform some useful external functions and can help limit bleeding from the skin as well as other skin complaints like burns, bruises, wrinkles, and eczema. Its anti-inflammatory and antiseptic properties are also excellent for the skin. The tannin content of the white oak bark is also responsible for its antiseptic properties which can help to prevent and treat both internal and external infections. The tannins bind with the proteins present in the tissues which help to stave off harmful pathogens and bacteria. White oak bark has been effectively used against urinary tract infections, dysentery, and vaginal infections. To treat any internal problems, you can take white oak bark supplements in capsule, tincture or tea form. White oak bark can also be used externally to protect against skin infections and to help treat a number of skin issues. It has been successfully used to treat poison ivy and to soothe the pain and inflammation from bee stings and bug bites. When applied to the skin, it may also help speed up the healing process from minor wounds, cuts, scrapes, and burns. It can even be a helpful natural remedy for mouth ulcers and herpes. You can apply it directly to your skin or make a cold compress with white oak bark tea or liquid extract. An alternative is to add a cupful of dried bark to your bathtub and letting your skin soak it up. White oak bark also has natural diuretic properties meaning that it can help promote both the frequency of urination and the amount of urine you produce. Diuretics like white oak bark are a useful, natural alternative to pharmaceutical diuretic medication for those who would prefer to steer clear of pharmaceuticals. As a diuretic, white oak bark can help improve the health of your bladder, help treat urinary tract infections and even eliminate kidney stones caused by the build-up of uric acid in the bloodstream. White oak bark can help to treat infections of the respiratory tract. Its saponin content means that it might have expectorant properties suitable for getting rid of mucus and phlegm from the respiratory system. In the days before dentistry, the native Americans used white oak bark to help treat oral infections and other dental issues like gingivitis and toothache. The bark contains antibacterial and antiseptic properties which can help prevent and treat oral infections as well as being an astringent that will help oral sores to heal. You can make a natural mouthwash by boiling up a cup of white oak bark tea and allowing it to cool. White bark extract is available in several different forms. In capsule form, the recommended daily dose is around one gram preferably taken with some food. As a liquid extract, the strength of each product will vary but the dosage range is usually in the region of 30 to 60 drops diluted with water to be taken two or three times each day. 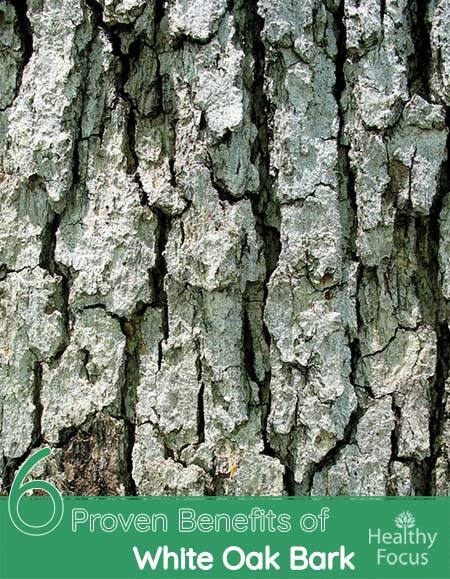 White oak bark can also be applied topically to help with skin conditions and minor wounds. When applied to the skin, it can help stop bleeding while forming an antiseptic layer that protects the wound and allows for healing to take place with less risk of any infection. It can also be used as an antiseptic hemorrhoid wash or douche. Pastes made with oak bark extract, flour and water can also help to draw out stings or splinters because of its astringent qualities. While white oak bark is generally considered to be safe for both oral use and topical use, there are still some precautions that you should be aware of. It is not recommended that you take white oak bark extracts for more than 2 weeks at a time and that you should always follow the dosage guidelines. It should not be necessary to take the supplement for more than 3 or so days to treat a complaint like diarrhea and the long-term use of the herb can cause some side effects. Side effects of an overdose include kidney or liver damage, nausea, and other stomach problems. Pregnant women and nursing mothers should play it safe and avoid using white oak bark supplements. It is also not recommended for people with preexisting kidney or liver disease. Children should not use white oak bark supplements. I hope that you have enjoyed reading and learned something new from this article. Have you ever used white oak bark supplements or drunk its tea? Let us know if you have and tell us what you made of it. We would be very happy to hear from you.